Teachers are being urged to use organ donation teaching resources to help pupils contribute to the Government’s consultation into an ‘opt out’ organ donation system. 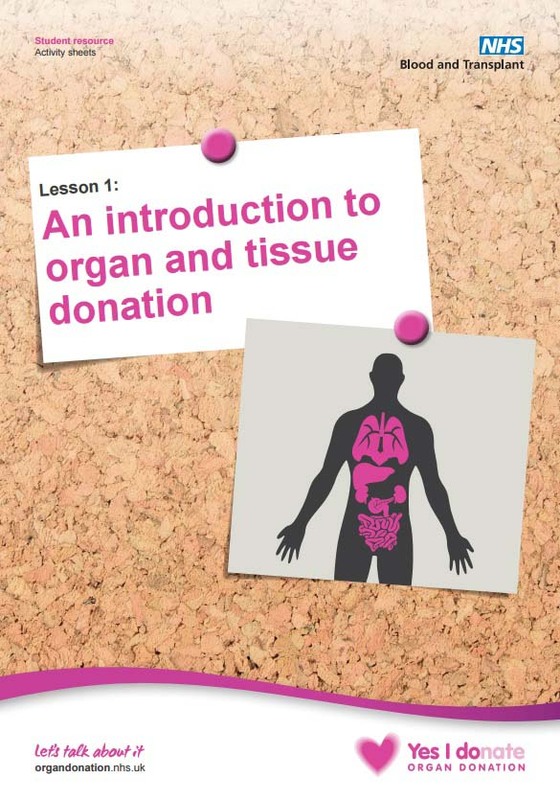 NHS Blood and Transplant developed the education pack for 11-16 year olds - for use in PSHE or science lessons - to provoke interest and debate in the lifesaving topic of organ donation. Since the opt out consultation was launched, six times as many people have viewed the teaching resources, showing a surge in interest in how organ donation works1. The Department of Health is running the consultation until March 6 and the resources are a way to discuss current news and give young people a voice on topic that has provoked nationwide interest and debate. The consultation was launched in December and under the Government’s proposed opt out organ consultation system, you would be a donor unless you don’t want to donate. There are currently 6,296 people on the transplant waiting list including 148 children. Around 20% of the people on the NHS Organ Donor Register are aged 16 to 20. However, NHS Blood and Transplant surveys show that while three quarters of 18-24 year olds in England support organ donation in principle, the levels of support are lower than for other age groups. The resources have received positive feedback from schools, and to date there have been more than 10,000 downloads from the NHS Blood and Transplant website page and YouTube channel. “This education pack gives young people the facts so that they can take part in the national conversation on organ donation. “Most opt out systems don't cover children and young people but this is an area where they will need to be equipped to make a decision as they approach adulthood. “Over a thousand young people are currently waiting for a life-saving organ, so the earlier we start this dialogue the more lives it could transform in years to come. “If the people want to opt out they can, and allow the other millions of people to save lives. The pack is aimed at Key Stage 3 and Key Stage 4 students (11 to 16 year-olds) in England, and includes lesson plans and materials linked to the Personal, Social and Health Education (PSHE) National Curriculum. It includes three lesson plans, each around 45 to 60 minutes, carefully linked to the PSHE National Curriculum. Resources include videos recorded with donor families and transplant patients, and take home fact sheets to facilitate conversations at home. 1. Between December 12th 2017 and January 24th 2018 the reaching resources had 978 views. Between December 12th 2016 and January 24th 2017 had 155 views.